The course and watershed of the Orange River. This map shows a conservative border for the watershed. Specifically, the Kalahari basin is excluded, as some sources say it is endorheic. Some other sources using computational methods show a basin which includes parts of Botswana (and hence of the Kalahari). The Orange River (Gariep River, Groote River, or Senqu River) is the longest river in South Africa. It rises in the Drakensberg mountains in Lesotho and then flows west through South Africa to the Atlantic Ocean. The river forms part of the international borders between South Africa and Namibia and between South Africa and Lesotho, as well as several provincial borders within South Africa. Although the river does not pass through any major cities, it plays an important role in the South African economy by providing water for irrigation, mining, industrial and municipal use, as well as hydroelectric power. The Vaal River basin, part of the broader Orange River basin, is the industrial heartland of South Africa, producing more than 25 percent of the country's gross domestic product (GDP). The Orange River has a total length of 1,367 miles (2,200 km). It rises in the Drakensberg mountains in Lesotho, about 120 miles (193 km) west of the Indian Ocean and at an altitude of over 3000 m. While in Lesotho, the river is known as the Senqu, and parts of it freeze in winter because of the altitude there. The river then runs westward, forming the southwestern boundary of the Free State Province. In this section the river flows over the Gariep Dam (the largest in the country) and on to the Vanderkloof Dam. From the border of Lesotho to below the Van der Kloof Dam the river bed is deeply incised. Farther downstream the land is flatter, and the river is used extensively for irrigation. At the western point of the Free State, southwest of Kimberley, the Orange meets with its main tributary, the Vaal River, which itself forms much of the northern border of the province. From here the river flows through the arid wilderness of the southern Kalahari region and Namaqualand in the Northern Cape Province to meet with Namibia. As it flows west, it forms the international border between the province and Namibia's Karas Region. In the last 500 miles (800 km) of its course, the Orange receives many intermittent streams, and several large wadis lead into it. In this section, the Namib Desert terminates on the north bank of the river, so under normal circumstances the volume of water added by these tributaries is negligible. Here the bed of the river is once again deeply incised. As the Orange River approaches Augrabies Falls it divides itself into numerous channels before cascading down the 56-meter-high waterfall, the world’s sixth largest. The river then continues its path through an 18-kilometer gorge. On this section of the Orange, the river descends 400 feet (122 m) in 16 miles (26 km). The Khoikhoi people called it the Place of Great Noise. Vegetation in this stretch is suited to the arid desert climate. The Kokerboom, or Quiver Tree, grows here. They are succulents and can store huge amounts of water in their stems and survive long periods of drought. The national park contains a game reserve with rhinos as the main attraction, but the river provides sanctuary to a diversity of species, from tiny succulents, to birds and reptiles, to springbok, gemsbok, and giraffe. This image shows only the last 100 km of the Orange River, a stretch where the gravel deposits in the river bed and along the banks are rich with diamonds; several diamond mines operate here. The Orange empties into the Atlantic Ocean at Alexander Bay, which lies about equidistant between Cape Town and Walvis Bay. Some 20 miles (33 km) from its mouth it is completely obstructed by rapids and sand bars and is generally not navigable for long stretches. 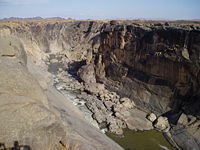 The Augrabies Falls during the dry season. In the dry winter months the volume of the water in the river is considerably reduced because of the rapid run-off and evaporation. At the source of the Orange the rainfall is approximately 2000 mm per annum, but precipitation decreases as the river flows westward; at its mouth rainfall is less than 50 mm per annum. The factors that support evaporation tend to increase in a westerly direction. However, in the wet season (summer) the Orange River becomes an impetuous, brown torrent. The huge mass of sediment carried constitutes a threat to engineering projects on the river. 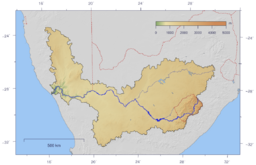 The total catchment of the Orange River (including the Vaal) extends over 973,000 square kilometers, i.e., about 77 percent of the land area of South Africa. Approximately 366,000 square kilometers (38 percent) is situated in Lesotho, Botswana, and Namibia. The Orange River provides a belt of green vegetation through an otherwise hot and dry desert. It also provides water to the Orange River mouth, which is used by many birds as they migrate from one hemisphere to another annually. South Africa became a signatory to the Convention on Wetlands of International Importance in 1971. It must therefore identify and protect areas of environmental importance with respect to wetlands used by waterfowl. The wetland is considered the sixth most important wetland in Southern Africa in terms of the overall numbers of wetland birds it supports. The wetland bird population can be as high as 26,000 individuals from up to 57 species, 14 of which can be considered endangered. 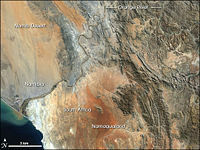 The Orange River basin has been populated since humankind's earliest days. The San (Bushmen) lived as hunter-gatherers and left their rock art in the caves of Lesotho. About 2,500 to 2,000 years ago, the Khoikhoi people used the river to water their sheep and cattle and referred to it as Nu Gariep. Later, Bantu-speaking peoples settled along the river in 1300-1600 C.E. The first European farmers arrived in the 1690s. 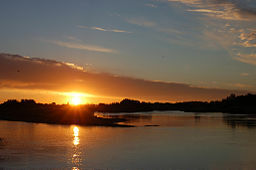 The river was named the Orange River by Colonel Robert Gordon, commander of the Dutch East India Company garrison at Cape Town, on a trip to the interior. Gordon named the river in honor of William of Orange. A popular but incorrect belief is that the name refers to the supposedly orange color of its water, as opposed to the color of its tributary, the Vaal River ("vaal" being Afrikaans for pale or gray). Since the end of apartheid, the original name, "Gariep," has had greater favor in official correspondence in South Africa, although the name "Orange" has greater international recognition. In Lesotho, where the river rises, it is known as the Senqu River. Panorama taken from a hill overlooking a bend in the river, in flood due to above-normal rains. 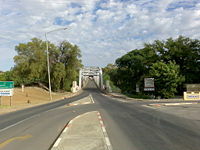 The General Hertzog Bridge over the Orange River on the southwestern border with the Free State. The Orange River plays a major role in supporting agriculture, industry, and mining, though the majority of the water is used for irrigation. To assist in this, two large water schemes have been created, the Orange River Project and the Lesotho Highlands Water Project. There are important deposits of alluvial diamonds along the Orange River and around its mouth. Because of the lack of dangerous animals and high water levels during summer, the western stretch of the river is used for recreational canoeing and rafting. give a new lease on life to water-deficient areas in the Eastern Cape, such as the Great Fish and Sundays River valleys. The Gariep Dam near Colesberg is the main storage structure within the Orange River. From here the water is supplied in two directions: west along the Orange River and south to the Eastern Cape. The Gariep Dam on the Orange River is the largest dam in South Africa and was a key part of the Orange River Project. Eskom operates hydroelectric power stations at both the Gariep Dam and the Vanderkloof Dam. The hydro-electric power station at the Vanderkloof Dam was the first power-generation station in South Africa situated entirely underground. The towns Oviston and Oranjekrag were established to facilitate the construction and operation of the new infrastructure. Irrigation in the vast area downstream of the Vanderkloof Dam, which has turned thousands of hectares of arid veld into highly productive agricultural land, was made possible by the construction of the Gariep and Vanderkloof Dams. While the land along the middle stretch of the river is used to grow cereals and fodder, farther west higher-value crops like table grapes, olives, and nuts are now being grown. In recent years the wine-producing areas along the Orange River have also grown in importance. Irrigation in the Eastern Cape has also received a tremendous boost, not only from the additional water that is being made available but also owing to improvement in water quality. Without this improvement the citrus farmers along the Lower Sundays River would almost certainly have suffered losses of productivity. The Lesotho Highlands Water Project was conceived to supplement the water supply in the Vaal River System. Water is stored at higher altitudes, where losses due to evaporation are less, and delivered to South Africa by means of a tunnel that passes under the Lesotho-South Africa border at the Caledon River and then under the Little Caledon River south of Clarens in the Free State and discharges into the Ash River about 30 kilometers farther to the north. The scheme became viable when water demands in Gauteng (which includes the city of Johannesburg) reached levels that could no longer be supported economically by alternative schemes. Lesotho benefits from the arrangement by receiving royalties for its water delivery and electricity generation, enabling the small state to pay off its debts. Rafting on the Orange River is a popular tourist activity. During the temperate months of March and April, given good rains and the sluices of the dams being open, a canoeist (or rafter) can easily travel 30 kilometers per day. The lower reaches of the river are most popular, because of the spectacular topography. The Orange River winds its way through the canyons of Richtersveld National Park with its rapids. Dramatic landscapes with rugged mountain ranges, metamorphosed lava flows, and ice-age deposits sweep away inland from the river, where fish eagles, Egyptian geese, and kingfishers enjoy the fish and the riverine vegetation. Commercial tours are available, and these expeditions depart from the border town of Vioolsdrif. Both the population and demand for the waters of the Orange River have been increasing, and full utilization is expected by 2020 as more acres are put under irrigation and industrial and municipal use expands. Much of the basin is experiencing some degree of water stress. The population living in the basin is 19 million. Discussions have been ongoing about building a dam on the lower stretches of the river to better manage its downstream flow. The Orange crosses international borders, but so far efforts have been made by the governments involved (South Africa, Lesotho, Namibia, as well as Botswana, which is part of the basin if not directly on the river) to work together peacefully to resolve tensions. An agreement was reached in 2000, the first multilateral basin-wide agreement between all the states. The agreement established the Orange-Senqu River Commission (ORASECOM) as a step toward international cooperation. In 2004, the commission set up a secretariat, an important step toward good governance in the region. The most severe ecological problem is soil erosion in Lesotho, where 2 percent of the soil is lost annually. The wetlands at the river's source that regulate the release of water are being destroyed by road building, overgrazing, and encroaching settlement. The resulting high levels of sediment in the river create problems at the dams and are destroying the wetlands at the river's mouth. Another ecological problem that needs to be dealt with is that of salts and nutrients from the use of fertilizers affecting the ecosystems and crops downstream. ↑ C. J. Swanevelder, 1981, Utilising South Africa's largest river: The physiographic background to the Orange River scheme, GeoJournal 2 (supp 2): 29-40. ↑ C. Revenga, S. Murray, J. Abramovitz, and A. Hammond, 1998, Watersheds of the world: Ecological value and vulnerability, World Resources Institute, ISBN 156973254X). ↑ South African Department of Water Affairs and Forestry. Orange River Project Retrieved February 26, 2009. ↑ 4.0 4.1 4.2 4.3 Anton Earle, 2005.A preliminary basin profile of the Orange/Senqu River African Centre for Water Research. Retrieved March 24, 2009. South African Department of Water Affairs and Forestry. Orange River Project Retrieved February 26, 2009. Swanevelder, C. J. 1981. Utilising South Africa's largest river: The physiographic background to the Orange River scheme GeoJournal 2 (supp 2): 29-40. Retrieved March 24, 2009. This page was last modified on 20 February 2015, at 22:51.